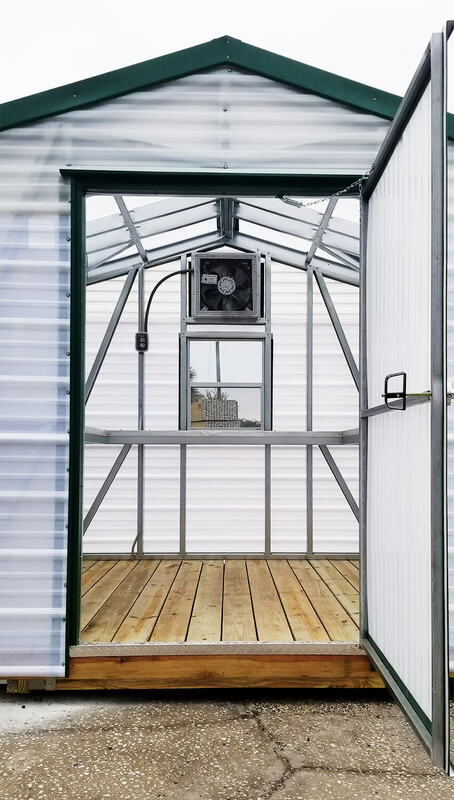 Robin offers more options than anyone, so custom order the Greenhouse that’s perfect for you! Years of experience have helped Robin design the grower’s choice of greenhouses. 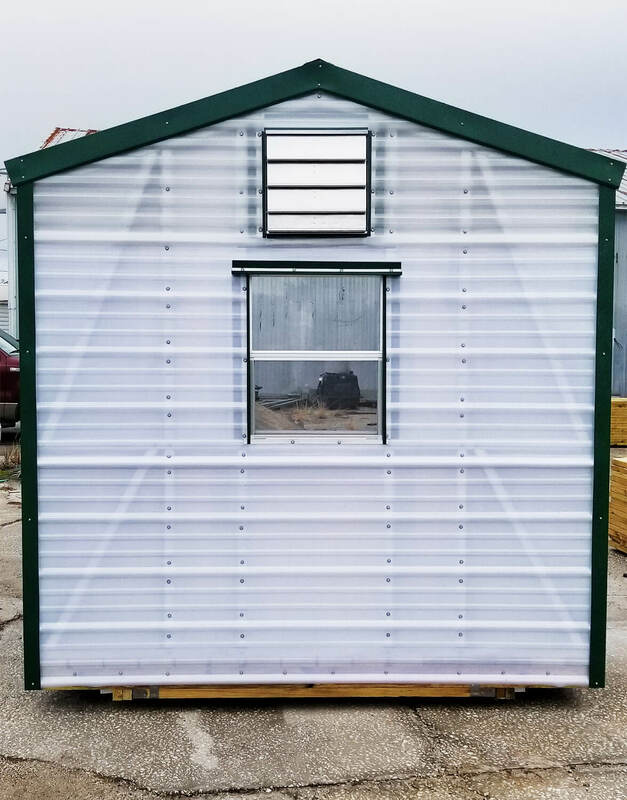 From its thicker shatterproof SolarSoft panels, specially made to block harmful ultra-violet rays, to the optional heavy-duty treaded floor, and the sturdy steel frame, it is by far the standard of excellence. 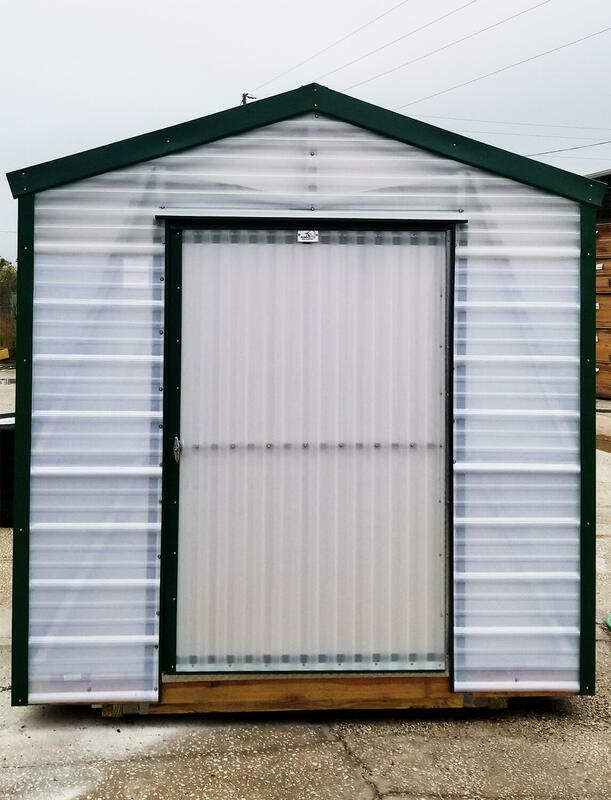 All Greenhouses come standard with functional mesh plant shelving, windows, protected electrical service, and our DuraFrame steel stud framing. Our standard Greenhouse is shipped without flooring, but has a steel rail so the customer can add mulch or gravel inside. A wide range of sizes and options such as extra shelves exhaust fan, floor system, and the convenient potting island, makes it popular among both home and commercial growers. Our Greenhouses are constructed with a DynaGlass SolarSoft exterior, specially formulated for Greenhouse use. DYNAGLASS SolarSoft is a corrugated polycarbonate with a guaranteed condensate control. The SolarSoft exterior has a 10 year warranty against yellowing, condensation control, and hail. SolarSoft will retain its clarity for many years. So, go with quality…grow with Robin. Your Greenhouse will be transported to your site fully constructed, fully wired and set in position. There’s nothing for you to do but enjoy years of carefree use! All Robin buildings are engineered from top quality materials chosen for strength and durability. Each building is protected against termites, vermin, rain, and moisture. Only Robin can offer this amazing warranty. Check with your local dealer about our easy "Rent to Own" option with no credit check. Click here for our Rent to Own APPLICATION. Check with your local dealer about our easy "Rent to Own" option with no credit check. Robin also offers financing through Robin Financial. We take pride in exceptional customer service. From providing print media, prompt response for quotations, quick delivery schedules, and service after the sale. All of these and others are all equal parameters in a successful dealer/manufacturer relationship.